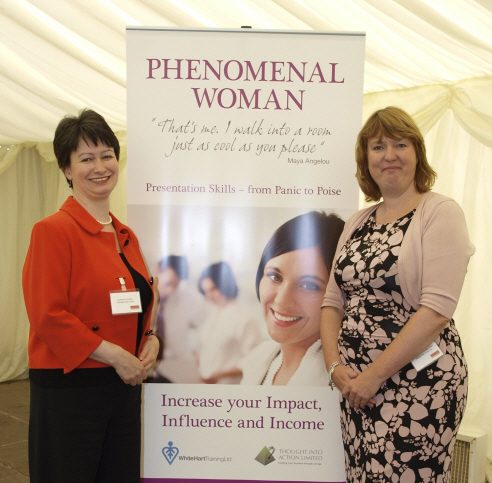 Raising the bar for women speakers, the Phenomenal Woman programmes deliver specifically targeted presentation skills training for women in business. Why women–only programmes? Because experience tells us that all too often women lack the confidence to deliver their important messages powerfully. Or when they do speak in public, their message is masked by an unconvincing delivery. These programmes are not for women who want to know the theory of presentations. They are designed for women who are serious about getting their message across. They have been created for women who recognise that speaking powerfully and persuasively to others is fundamental to business success. Women who want to get even better at expressing themselves in an influential and inspiring way will find these workshops and mentoring groups the perfect way of developing their skills and their confidence. The Phenomenal Woman programmes (after a poem by Maya Angelou: “…that’s me. I walk into a room just as cool as you please…”) are delivered by Karen Hands of Thought into Action and Catherine Sandland of White Hart Training. This is a collaborative partnership: Catherine has extensive experience of training and coaching many speakers in presenting skills. Karen overcame a fear of speaking to almost exclusively male audiences in her previous role as an engineer and wants to share that hard-won experience so we don’t all have to make the same mistakes. Get real – no thanks I DON’T want to listen to you! 5 things that get me MAD at networking events!